Hefty discounts, improved comfort, speed, reliability and convenience are taking train travel in Germany to new heights. Even as more cars pour off production lines, more and more residents of Germany are turning to the railroad for business and leisure travel. This is particularly true for trips up to several hundred kilometers, rides too lengthy for automotive day tripping, or too expensive for domestic air travel. Domestic rail travel is quite cheap. (A BahnCard lets you travel year 'round at 1/2 price; more on that later.) Best of all, since the privatization of the state-owned Deutsche Bundesbahn, enormous sums of money have been invested in upgrading roadbeds, equipment and introducing high-speed, comfortable, clean express trains nationwide. Fast, efficient, computerized reservations systems, ticketing and credit card usage have further enhanced the Bahn's success for intermediate and long-haul passenger service. Furthermore, the famed, no speed limit Autobahns now have long stretches with speed limits in populated, high-traffic or dangerous areas. Blitzing along at anywhere from 160 - 230 km/h for more than a few kilometers at a crack is nigh unto impossible these days. While gasoline prices have almost doubled in the last decade, train fares have risen by only about thirty percent. Armed with a cellular phone (not officially allowed but tolerated), laptop computer and calculator, thousands of business folk are literally "working on the railroad" all the live-long day. A six-hour or less ICE run to Hamburg from Munich, or from Frankfurt to Berlin is generally at very least an hour faster and infinitely less stressful than taking the car. An hour or two in the bistro, club, or restaurant car provides relaxation as well as refreshment. Contract caterer Mitropa's food has improved and occasionally features a monthly menu which actually tastes fairly good. Better, in any case, than cramming an egg salad sandwich down one's gullet while steering the car, yelling at the kids, or trying to drive defensively while the Handy is ringing furiously or you're stuck in a stau. Among major projects the Deutsche Bahn is instituting is the total upgrading and refurbishment of the huge Wilhelminian rail station edifices that were the architectural wonders of their day. The new approach wants to make the rail station serve as a source of civic pride just like a century ago. Posh restaurants, shops, meeting rooms and facilities for relaxation while meeting or greeting or bidding farewell to friends and associates are as important as adequate ticketing facilities, baggage storage areas, kiosks, and comfortable, clean waiting areas and restrooms. Leipzig's rail terminal in the heart of that Saxon city is a case in point. Where the former Royal Bavarian and Royal Saxonian rail systems once interfaced has just undergone a two-year overhaul and is now a city center unto itself similar to Berlin's Euro Center. Another case is Frankfurt's rail station. Outfitted with a new, multi-story, light, airy, current-day travel passenger lounge, it likewise is being cleaned up. Enhanced traveler shopping, dining and refreshment areas and facilities are among station improvements. Bahn and Stadtspolizei in mufti and in uniform are also highly visible, cleaning up the unsavory elements who used to make a visit to the Bahnhofbereich less than pleasant. TV surveillance and cleaner, brighter public areas are helpful in maintaining a safe environment. Also helpful are announcements increasingly being made in English or French. Improved audio systems are helping make advisories more understandable, too, and not just in the Main City. One of the Bahn's biggest enterprises is the new and spectacular multilevel Lehrter Bahnhof being constructed in the heart of Berlin. This five-story superstructure located a stone's throw from the Reichstag will house long distance east-west tracks on one level, north-south on another, an S-bahnhof on the third level and a U-bahnhof in the basement. There will be an enormous ground floor promenade with luxury shops and restaurants as well as a parking garage. Completion is set for sometime after the year 2000. 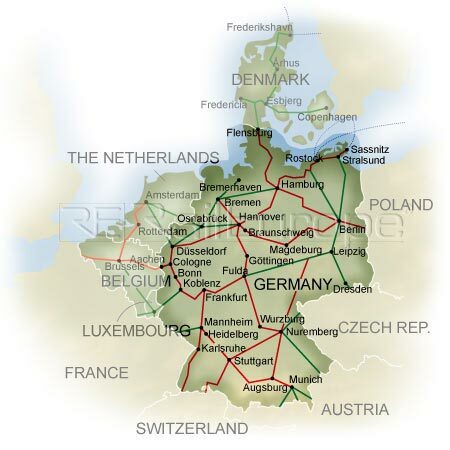 Another huge improvement to be completed within two years is the super express route from Frankfurt Main Station-Frankfurt Airport-Wiesbaden-Montabauer-Bonn-Cologne. When completed, the 195 kilometer stretch will whisk people to and from the Rhein-Ruhr area reducing the current time from two-and-a-half hours to a mere 58 minutes! Air passengers can already see the vast site taking shape when approaching Frankfurt on landing. Huge swatches of right-of-way are cut through the woods from the current trackage and an enormous multi-layer cloverleaf at the Frankfurter Kreuz now incorporates the new right-of-way. The new FFM Airport ICE transit Bahnhof will be between the A3 Autobahn and Schnellstrasse 43, parallel to the north side of the Sheraton Hotel complex between Terminals 1 and 2. Regional and local Bahn, and S-Bahn traffic in Terminal 1 will continue to feed the super express line. The Bahn is also providing Munich's Airport with a second rail feeder line cutting the trip from Augsburg by more than 90 minutes. Stuttgart's upgraded airport also has a speedy S-Bahn connection serving as a feeder to the long distance train terminus downtown. Because of high price of long-term parking at German airports, the Bahn provides one of the fastest and most economical means of getting out to the airport, particularly in bad weather or heavy traffic periods. Another neat feature of train-to-the-plane is free S-Bahn transportation to the airport in conjunction with a valid rail ticket and air ticket on day of travel. O.K, it's only five or six Marks, but it all adds up fast especially with the family or friends coming along! In addition to BahnCard discounts, family, group, youth and handicapped fares, and special destination discounts as well as evening and night travel reductions help keep down the cost of train travel. BahnCards can also be issued with a credit card function and all BahnCards now have positive photo identification. The BahnCard must be presented with the ticket to conductors when requested en route. Forgot your BahnCard? The difference in price must be paid on the spot although this can later be refunded. Major credit cards are readily accepted at all primary stations and even on board most trains. However, there is a surcharge if stations are open. Local or regional tickets can be likewise purchased by credit card, in self-ticketing machines in stations, or on platforms. Monthly commuter, regional or system passes provide even greater savings and interface with metro or regional trams, buses and subways making commuting or frequent travel easier, not to mention saving a fortune in cab fares. While sleeper cars cost the price of a modest hotel room (+/- DM 115) between Germany's long distance runs like Bonn-Berlin, Munich-Kiel-Luebeck, Oberstdorf-Hamburg, or to Vienna, Paris, Milan or Moscow, an even cheaper alternative is the couchette or Liegewagen (DM26 or so.) Although cramped, it can be fun when traveling with friends, and certainly is better than sitting up all night. Overnight trains with sleepers/couchettes do however travel more slowly; a trip to Berlin or Paris taking up to two and a half hours longer. In some older cars younger travelers can get away with extending their pull-out coach seats in compartment cars and still get some shuteye without ponying up more money. One cautionary note: thanks to the revitalized interest in train travel, making reservations is almost always a good idea, especially on EC, IC and ICE trains regardless of hour of departure or day of the week. Far too often, passengers wind up standing for hours particularly in heavy traffic periods. It pays to plan and reserve ahead of time. BVG - the online schedule information for public transport in Berlin and Brandenburg. german rail, german rail map, german rail schedule, german rail travel, german rail schedules, german rail pass, german trains, german rail passes, german rail tickets, germany rail, german train, german railways, german railway, german train schedule, german train schedules, german train tickets, german train travel, german rail timetable, german rail system, german twin rail pass.